Listeners were first introduced to the soulful and conscious crooning of singer Gramps Morgan as a member of the renowned reggae band Morgan Heritage. But these days fans are getting to know the artiste in a whole new realm as a performer hunting success as a bonafide solo act. 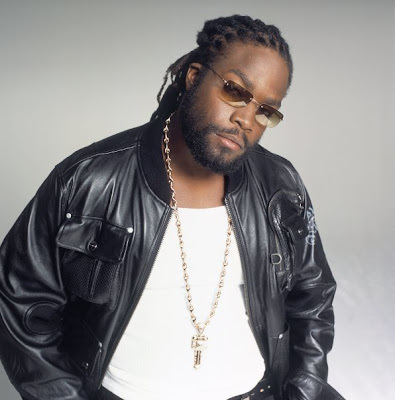 While he has not ditched his Morgan Heritage siblings for good, he has already released a well-received solo album, recorded a hit song with India.Arie and toured with John Legend and Buju Banton. Now, he’s ready for more. He talks to TALLAWAH about flying solo, his professional relationship with India.Arie and his 2010 plans. TALLAWAH: Last August, you independently released your first solo recording, Two Sides Of My Heart on your Dada Son Entertainment label. How’s the promotion been going, and what direction did you take with this album? Gramps Morgan: It’s been going very well. We’ve been promoting it locally and throughout the Caribbean, just raising awareness and letting the fans know about. It’s actually going to be done in two volumes. Volume I is now available and it is mostly reggae, but Volume II will show some of the other genres that have influenced me like country and R&B. With this album I want to show off different sides of me. TALLAWAH: In the music industry, we all know the perils that can come with stepping out of a group to fly solo. What’s it been like being away fro your Morgan Heritage fam? Morgan: It’s been a challenge. Performing with them was easy and comfortable, but being by yourself, the work load and ethic is heavier. Now you have to carry a whole song by yourself. TALLAWAH: So what’s the status of the group exactly? Will you solo career be permanent? Morgan: We’ll be back together definitely. We still perform as a group, we still tour mainly in Africa, but we won’t be releasing another album for now. We are still a group. TALLAWAH: What have you learned about your abilities since embarking on this solo adventure? Morgan: I have learnt that there is a lot more depth and range to my voice. There is a lot I can do on my own, so when the time comes for the group to get back together, it will be better for us. I have also been learning from touring with artistes like India.Arie, John Legend and Buju. It’s all been a learning process. TALLAWAH: Speaking of India.Arie, is it true that you two were dating at one point? What is the nature of your relationship with India.Arie? Morgan: (Laughs). No, that is far from the truth. Our relationship is totally professional. TALLAWAH: How did you first meet her? Morgan: I met her at a venue that we were both performing at. We met through a friend. She knew of my work, and said she loved my voice and wanted us to do something together. So she called me up, and we did the song [“Therapy”], which is on her new album that is now up for a Grammy for Best R&B Album. 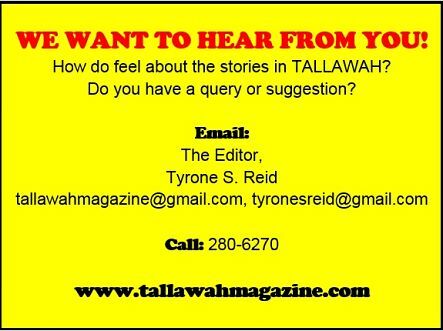 TALLAWAH: Do you have a family of your own? Morgan: Yes, I have kids. They are here in Jamaica but I can’t give too much detail on that. Have to keep that private. Can’t put everything on top of the lighthouse (Laughs). TALLAWAH: Understood. What career plans do you have for this year? Morgan: I have upcoming shows in California, and I am also doing some benefits for Haiti. I was doing tours last year so I am on a break now and just looking towards bigger and better things for this year. SOUL ON FIRE: Chris Daley (Alfred) is a man overwhelmed in For Better Or Worse. Life is too fraught with surprises not to enjoy the fascinating yet sometimes bumpy ride. Life is to be enjoyed. So says a character in For Better Or Worse, and it’s one of the most telling lines in this daring and innovative new play from award-winning playwright Basil Dawkins. For Better Or Worse, which re-teams Dawkins with director Douglas Prout, has flair and finesse. The set is lovely and the lighting makes it come alive exquisitely. But it is the writing, the solid performances and the fleshy substance that makes this production one of the best offerings now available to local theatre audiences. Alfred (Chris Daley) and Marcia (Sakina) have been married for seven years, sharing a modest home in St. Catherine with their two young daughters. The play opens on the night of Marcia’s 29th birthday, but instead of merriment, a heaviness hangs in the air. Marcia, a young career woman, proceeds to make it abundantly clear to her stay-at-home hubby that she is suffocating in the marriage and is tired of bearing the burden of being the sole breadwinner. As she puts it, she is “trapped in a life of boredom,” and craves change and social mobility. SENSUAL SEDUCTION: Ruth HoShing and Sakina share a scene in For Better or Worse. She leaves with the kids and moves in with her calculating boss Enid Shields (Ruth HoShing), a successful and ballsy businesswoman, who lives in a posh suburban residence and easily influences Marcia with regular talk about “quality living.” Back in St. Catherine, a devastated Alfred forges an unforeseen friendship with his tempting new tenant Patience (Terri Salmon), an attractive grief counsellor who helps him to “rise above” nonsense and temptation and see life through different eyes. The dialogue is expectedly crisp and witty without feeling forced, given that Dawkins is a remarkable student of relationships and the human condition. And then there are the performances. Daley (who alternates with Jerry Benzwick) handles Alfred quite capably, giving the character a believably nerdish quality that speaks to his occasional infirmity of decision. Sakina and HoShing are superbly convincing, but Salmon is the best performer here, showing off plump dramatic chops in her small but distinctive part. For Better or Worse is about actions and consequences, risks and sexuality, and what happens when we refuse to cherish the life we’ve been given. Throughout his career, Dawkins has consistently pulled back the layers on human relationships in his work to expose the flaws that often lurk beneath. But while addressing the crises and predicaments people face in their unions, the playwright also offers solutions and highlights the life lessons inherent in everyday experiences we often fail to acknowledge and appreciate. That’s Dawkins’ gift. LIT LOVERS: A section of the standing-room only audience at Hutchinson's book launch last Friday. Above: Hutchinson reads excerpts from Kin Teet Kibba Heart Bun. Joan Andrea Hutchinson loves to take us down memory lane. So it came as no surprise that before reading excerpts from her new cultural volume, Kin Teen Kibba Heart Bun, last Friday evening at Bookophilia on Hope Road in St. Andrew, she regaled audience members with absorbing tales from her childhood, which she said also served to inspire her latest work. In the meantime, Hutchinson’s next project, already in development, is a collection of Jamaican myths, to be published at the end of 2010. WE BELONG TOGETHER: Nadia Khan (Justine) has a lot of love for Clive Duncan (Bill) in The Love List. Fantasy and reality, superficiality and depth square off in The Love List, branded as a screwball comedy for mature audiences. Originally penned by Norm Foster but adapted and directed with a fresh perspective by Pablo Hoilett, The Love List is sporadically tedious, but at its best, the play is ferociously funny and smart, buoyed by stellar performances from the top-notch cast and an outstanding, eye-catching set design. Exploring romance, trust and deception, The Love List introduces us to Bill (Clive Duncan), a single, hardworking statistician who just turned 50. To celebrate the milestone his close writer pal Leon (Munair Zacca) invites him to fill out a list of the ten qualities he desires in a woman, which will then be turned over to a reader woman for the results to take effect. Bill is not too keen on the idea, but considering his divorce and lack of exciting female prospects he finally gives in to Leon’s persuasive arguments. Bill receives the greatest surprise of his life when a mysterious Justine (Nadia Khan), suddenly and inexplicably appears at his door one evening and makes herself at home. Even more astonishing, she seems to fulfil all the criteria on Bill’s love list. Devoted and overly doting, she delivers “everything he has ever wanted in a woman.” But the million-dollar question remains: who is Justine, and what exactly is her story? ABOARD THE LOVE BOAT: Nadia Khan, Munair Zacca and Clive Duncan share an awkward moment in The Love List. In The Love List, comedy, drama, mystery and fantasy are thrown together for an entertaining, rib-tickling mix. If only certain crucial scenes (opening and penultimate, for example) weren’t so “pedantic.” Perhaps the culprit is the play’s occasionally heavy-handed pacing. Nevertheless, Hoilett is able, for the most part, to imbue the production with regular doses of intensity, passion and infectious energy, while educing robust acting from his trio of players. Zacca, as the blunt, alpha-male Leon, offers a study in engrossing acting, crafting a character that is as charismatic and charming as he is officious and womanizing. To the contrast, Bill (as credibly portrayed by Duncan) is given to sensitivity, sentimentality and idealism. No wonder he falls for Khan’s female wiles. After all, nobody does the erratic, chatty and sensuous chick quite like Nadia Khan, and in The Love List, she cooks up one helluva fiesta. In a nutshell, shortcomings aside, The Love List has genuine appeal in its attempt to shine new light on something as archaic as the notion of landing the perfect romance. But, as the popular saying goes, be careful what you wish for. MY HUSBAND MAKES MOVIES: Daniel Day-Lewis and Marion Cotillard in a scene from Nine. Running Time: 1 hr 19 mins. Rob Marshall’s Nine is one of those song-and-dance productions (Hairspray, Mamma Mia!) that deliver spectacular musical numbers and strong individual performances, but the dialogue (among other crucial elements) is just not as captivating. Marshall (who helmed the Oscar-wining Chicago), adapts the 1982 Broadway production, which is based on French director Federico Fellini’s 1963 film 8 ½, but instead of appealing substance and marvellous poetry on film, Nine is surprisingly uneven and only sporadically entertaining. More to the point, the show-stopping musical numbers are essentially the only highlights. Daniel Day-Lewis (great actor, terrible vocalist) is Guido Contini, a filmmaker who is experiencing a creative and personal crisis. He wants to make his ninth film but lacks inspiration. To rediscover his passion for filmmaking, as well as the meaning of love, he turns to the many women in his life, including his mistress (Penelope Cruz), his longsuffering wife (Marion Cotillard), his muse (Nicole Kidman), his dead mother (Sophia Loren) and his costume designer and confidant (Judi Dench). He also dallies with an American fashion journalist (Kate Hudson) sent to do a story on him. Nine simply lacks the requisite fierce passion; it often feels chaotic (particularly the early scenes) and the dialogue does very little to inspire or even meld the whole affair together. The best performers are Cotillard (offers a splendid “My Husband Makes Movies”) and Cruz (her versatility never ceases to amaze me). Ultimately uneven and startlingly disappointing, Nine is so not a perfect 10. HOTEL BIZ: Everaldo Creary and Donald Anderson in Trevor Rhone's Smile Orange. 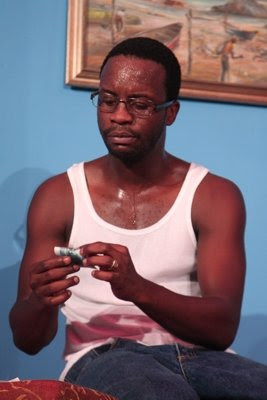 This week, TALLAWAH officially kicks off the 2009-10 Actor Boy Watch special with a look at the category of Best Supporting Actor. A strong supporting actor can greatly influence the overall success of his production by providing the essential muscle that supplements the work of lead performers. 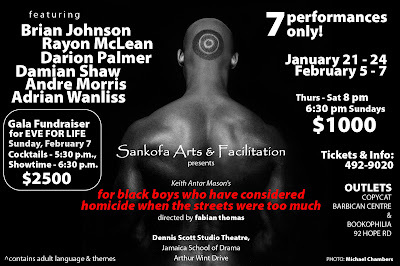 That said, here are the top five most outstanding performances from supporting male actors I saw on the Jamaican stage in 2009-10. As the arrogant but talented fading singer Jimmy “Thunder” Early, Cathnott’s powerful voice and effortless masculinity works well in a vital and distinctive role with substance. This Jimmy definitely got some soul. When it comes to comedy, Creary often reliably pulls out all the stops to make his performance convincing and memorable. As the Busboy in Trevor Rhone’s Smile Orange he achieved just that. Hutchinson was equally magnetic and terrifying as the ruthless Candyman, who will stop at nothing for “one night with Diana.” Leave it up to Hutchinson to imbue the character with the right amount of craftiness, fright and occasional ludicrousness. Alongside Dahlia Harris and Douglas Prout, Rodney superbly held his own as nosy hotel security guard caught up in a torrid affair between two feuding lovers, displaying his impressive ability to bridge drama and comedy in his work. Wilson rarely has to exert much during a performance to arrest attention. However, when he does get a role (such as Scav in Easy Street) that requires him to dig deeper than usual, the performance is often compelling, the effort tremendous. 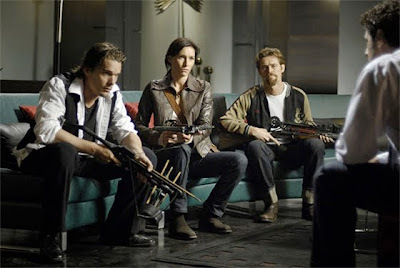 VAMPIRE SLAYERS: Ethan Hawke (left), Claudia Karvan and Willem Dafoe in Daybreakers. In Daybreakers, yet another ambitious vampire saga, Ethan Hawke (Training Day) packs on a few extra pounds and a couple fangs for his return to cinemas as a vampire haematologist who turns against his own kind to help save humankind. Touching. It’s 2017, and the world is ruled by vampires who far outnumber the living, in this horror film also starring Sam Neill (Jurassic Park), as a powerful and ruthless corporate honcho and a terrific Willem Dafoe as bloodsucker slayer. A virus has spread across the earth, turning its inhabitants into vampires. With their blood supply dwindling, the vampires must find a way to sustain their source of food. A fun, ambitious flick that’s occasionally able to fulfil its ambitions, Daybreakers moves swiftly in its exploration of greed, corporate oppression, and good over evil. There’s a lot of gore, but it’s a satisfactory and bloody entertaining spectacle from the Spierig Brothers, with a moody and brooding atmosphere, and good use of Hawke’s quiet, unassuming demeanour. 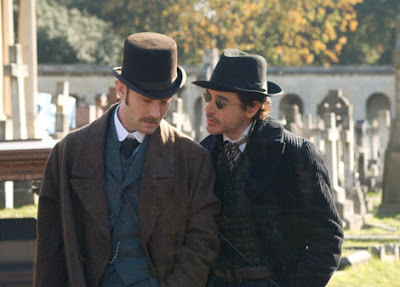 SLEUTHS: Robert Downey Jr. (right) and Jude Law in Sherlock Holmes. As a Sherlock Holmes purist, I am consistently impressed by the famed literary sleuth’s marvellously wicked wit, intelligence and knack for logic and case-cracking derived from creator Sir Arthur Conan Doyle’s legendary mystery stories. So you can imagine my shock to discover that Guy Ritchie (RockNRolla) had re-imagined my literary hero as an obnoxious, unhygienic and action-loving hack for his latest film, Sherlock Holmes. While the storytelling and cinematography are often delightful (the London setting is also wondrously depicted), there is just something unsettling about seeing an icon of literary genius made into a source for cheap jokes and wishy-washy fight scenes, though the man’s brilliance and Robert Downey Jr’s commendable attempt to do him justice intermittently shine through. But what’s with the superfast-talking? Rachel McAdams (Holmes’ “love interest”) fails to impress; Jude Law doesn’t exactly make for a believable Watson, that-closer-than-brother pal of Holmes, and Mark Strong’s villainous turn as a murderous black magician leaves a lot to be desired. Sadly, for all the exhilarating scenes that Sherlock Holmes manages to deliver, there are enough plot holes to cancel each one. In the following dispatch, a highly respected Haitian journalist describes how his home and office collapsed in the 7.0 earthquake that levelled infrastructure and uprooted lives in Haiti on January 12. Fortunately, his wife, Shirley, and children, Jennifer, 7 and Stephan, 1, survived. PORT-AU-PRINCE (Reuters) - Call it fate, or the luck of the draw, but I'm convinced the thing Americans know as a snow cone or slurpy saved my life when the walls came tumbling down and my home city fell all the way into hell last week. I had picked up my 7-year-old Jennifer from school and although I was running late because of heavy traffic I gave in when she asked me to stop to buy her one of those syrupy shaved ice treats known in Haiti as a "fresco" before heading back to my office in the Canape Vert district of Port-au-Prince. Our stopover took longer than expected and the earthquake struck as I was still driving in the street, just a stone's throw away from the entrance to my office. As dust clouds and panicked cries for help rose all around me, my wife Shirley somehow managed to get a call through to my cellphone. She had been working in my office, on the top floor of the three-story building, and said it was collapsing all around her. I jumped out of the car and saw, and saw for the first time that the building had pancaked, its heavy concrete roof jutting out at awkward angles atop the rubble. I appealed to stunned passers-by to lend me a hand as I called out Shirley's name repeatedly and started peering through the remains of the building to look for her. In what I can only describe as a miracle, I got another call from her about an hour later saying she had survived the fall with no injury and was now on the street outside our destroyed home, with Jennifer, our one-year-old son Stephan and a housekeeper. I took off running for home, dodging piles of rubble and collapsed cars along the mile-long (1.5-km) route, and tearfully embraced Shirley and the children when I got the last call I received that day, just before mobile phone service and Haiti's communications with the outside world collapsed. The call was from Pascal Fletcher, the Miami-based Reuters bureau chief for the Caribbean and U.S. Southeast. I fed him all the colour and information I could, promising to call back just a short while later. But further communication was impossible until the following day, when I found a working Internet line to email the Miami bureau. As a journalist, I have been torn between covering the dramatic story here and looking out for my family. With our home in ruins, we had to camp out on the streets and on the floor of a friend's restaurant in the immediate aftermath of the quake. But I also need to report what is happening in my suffering and deeply impoverished homeland. It is a difficult balancing act, and I answered Shirley's repeated protests by explaining that doing my job was also a way of supporting my family. On Sunday morning, I managed to get Shirley and the kids lined up to board a Canadian emergency relief plane flying back to Canada. They are now safe there and I have been able to devote my undivided attention to our news coverage. Across Port-au-Prince, tens of thousands of bodies have been pulled from the rubble and many more have not yet been recovered. More than a week later, rescue teams are still finding survivors but there is no way of knowing how many more are trapped, waiting for help. 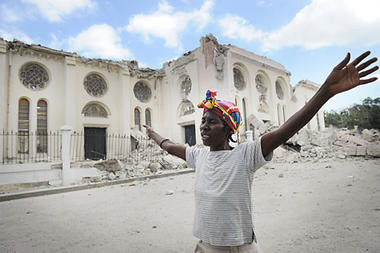 Haiti was a bad place even before the earthquake. But everything is broken now in the capital of a once-proud country, where slaves threw off French rule to establish the world's first black republic more than two centuries ago. The country, and those that have come to help, now face a huge challenge in fixing it. Give the misery across the city, I consider myself lucky and I'll always remember the instant when, not wanting to disappoint her, I pulled off the road to get Jennifer that "fresco," a moment when we chilled out at a roadside store shortly before Haiti was turned upside down. If not for that stopover, I may well have been crushed on the ground floor of my office building. Like so many other structures across Port-au-Prince, it is now just a makeshift cemetery or mausoleum. The building housed SOS Journalists, a press freedom watchdog group that I founded in 2005. The group has succeeded in freeing several Haitian journalists subjected to arbitrary arrest and works with hundreds of reporters and other media professionals to provide training and legal assistance in cases of journalists killed or targeted for violent reprisals because of their work in Haiti. In the chaos of the last few days, I have no way of knowing how many people were in the building when it crumbled and how many have lost their lives. It could be years before the rubble there is finally removed. I can only hope that Shirley was alone when she called to say it was falling to the ground. Joseph Guyler Delva, known to his colleagues as "Guy," is one of Haiti's most prominent journalists. He heads the local organization, SOS Journalists, which works to promote press freedom in the Caribbean nation. Guy, 43, been working for Reuters since 2004, covering everything from political turmoil to natural disasters. He has faced intimidation and death threats in the course of his reporting. 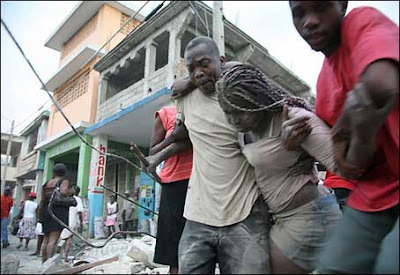 His first dispatch on Haiti's January 12 earthquake was one of the first detailed eyewitness accounts to the outside world reporting on the panic and scale of destruction in the streets of Port-au-Prince. BRAVE BIRD: Cherine Anderson to thrill fans at Jamaica Jazz & Blues 2010. Passionate and soulful dancehall-soul songbird Cherine Anderson, is gearing up for her first big assignment of 2010 – a live main-stage performance at the Jamaica Jazz and Blues Festival on Thursday, January 28, at The Greenfield stadium in Trelawny. Anderson will share billing with multi-Grammy winner Babyface, The Whispers, Joss Stone, Monty Alexander and Joe Roy Jackson. It's hard to believe that this is Anderson's first time taking the stage at Jazz & Blues. Never one to disappoint her loyalists, Anderson promises a powerful yet feel-good performance. "Come out and expect to have a good time. There is a lot going on in the world right now, so this performance is more than just entertainment; it's for a cause,’ she says. “Jazz & Blues has decided to donate to Haiti's earthquake relief, and I'm gonna give it my everything. I'll be performing something extra special for my supporters and those who will be seeing me for the first time." In 2009, Cherine made history by becoming the first Jamaican female singer to hit the Billboard rock charts as a featured performer on Michael Franti and Spearhead's "Say Hey (I Love You).” The song peaked at #1 on Billboard Heatseekers charts as well as iTunes Alternative Charts. In December, she graced the holiday issue of Buzzz Caribbean Lifestyle Magazine, spilling details on her new plans to the mag, including her desire to release her long-awaited debut album by the second quarter of this year. Stay tuned, 2010 seems poised to be another monster year for this unstoppable young reggae star. The third annual Louise Bennett-Coverley Reading Festival will be held on Saturday, January 30, from 2:00 to 4:00 pm at South Regional-Broward College Library in Pembroke Pines, Florida. 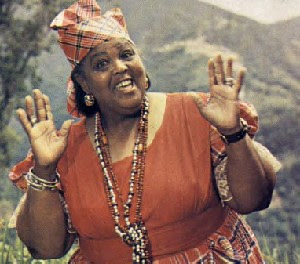 The celebration titled "Miss Lou and Wi Kulcha" will feature an exciting group of panellists, who will address several facets of Jamaican culture involving the late great Miss Lou. Lilieth Nelson, writer, performer, educator and former Chairman of the Traditional Folk Forms Committee of the Jamaica Cultural Development Commission will address the ‘Element of Music’ and will also be launching her new book, Angles of Reflection: Poems by Lil. Dr. Marcia Magnus will serve as moderator. The Tallawah Mento Band will provide entertainment. Admission to the event is free. Refreshments will be served and signed books and CDs will be available. For more information call 954-201-8825. PM BRUCE GOLDING: "Pray For Me"